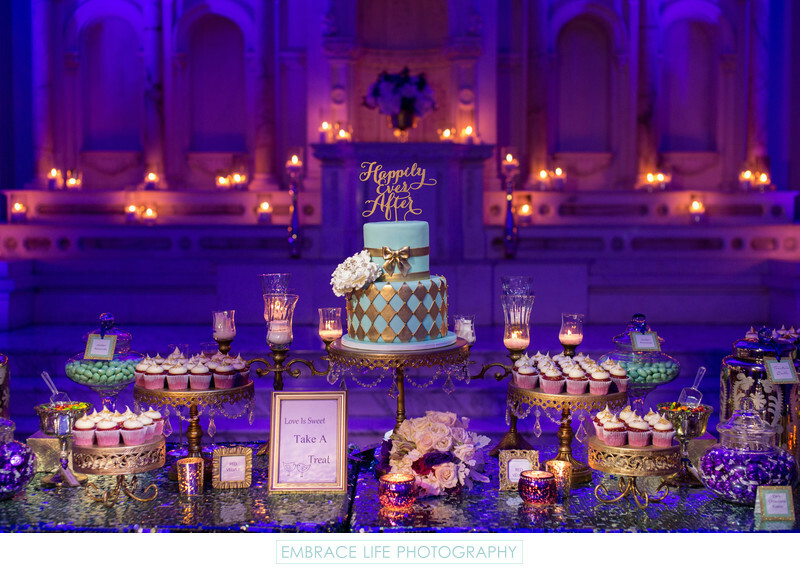 Vibiana is one of the most beautiful wedding venues in Los Angeles and this luxurious cake and dessert table designed by Twos a Party lives up to its standards. The torquoise and gold cake, as well as several cupcake displays by Fantasy Frostings, sit atop elegant gold cake stands with dripping crystals, surrounded by low and tall candles alike, a gold picture frame, colorful candy, flowers by Butterfly Floral, and an incredible sequin tablecloth by Luxe Linen. What was once altar of the former church, is vibrantly lit in purple and accented with the warm glow of candle light. Wedding planner Chic Ambiance executed a breathtaking vision by bringing together all of this creativity and beauty.